DC goes "Big" and returns to form with this fun and upbeat super hero flick. Although Shazam, created in 1939, isn’t necessarily one of the DC universe’s most widely-known characters, the character’s naming origin story has become one of the most talked-about elements of Shazam!’s release. 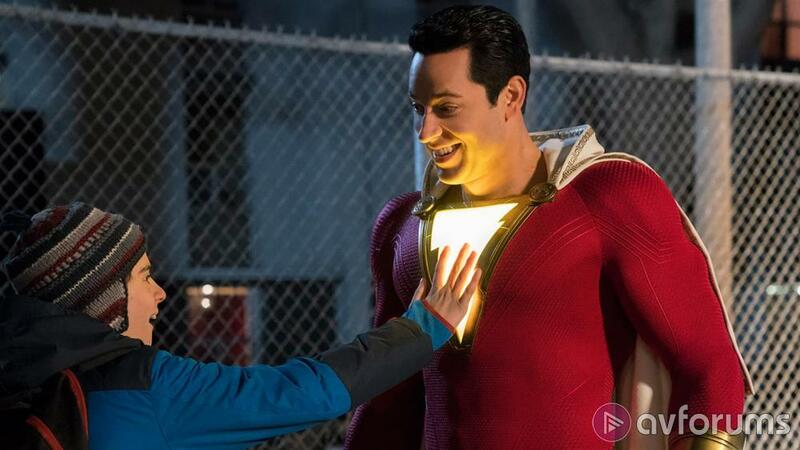 The debacle – which involves the character now known as Shazam originally being known as Captain Marvel – is well-known amongst comic book aficionados and is probably of little interest to others; it’s an interesting bit of comic book culture drama, but upon watching Shazam! all the fighting and controversy and legal action fades away. David F Sandberg’s film is a rip-roaring funfest – it’s precisely what the dark, dour and generally bleak DC Universe needed. True, it’s another comic book superhero film – but it’s really well-made, fun, colourful, funny, exciting and kid-friendly. It’s the perfect Friday after school treat film, bolstered by genuine humour and a well-explained backstory. The film’s cold open introduces us to a young boy (Ethan Pugiotto) who will eventually grow up to be Dr Sivana (Mark Strong), our titular hero’s nemesis. We’re then fast-forwarded to meet Billy Batson (Asher Angel), a tragic teenager who’s searching for his mother as he moves from foster home to foster home. Not long after being placed with a new family, Billy has a run in with a wizard (a memorable appearance from Djimon Honsou) who bestows magical powers on him – when Billy shouts “shazam!” he’s transformed into his handsome, energetic, magical alter ego Shazam (Zachary Levi). Shazam! succeeds because it understands what its audience wants. Where literally countless recent iterations of superhero films have become incredibly gritty, dark and adult-focussed, Shazam! returns some of the nostalgic childhood heroism of the first years of super hero films and cartoons. Angel is strong as Billy, while Jack Dylan Grazer as Billy’s friend Freddy is a scream – this is a really likeable duo who could have had an entire buddy-comedy movie of their own. Some of the most relatable and heart-warming scenes are those away from the zany adventures of Shazam, as Billy settles into life with his new family in the Vasquez house with family members including Freddy, protective Mary (Grace Fulton), geeky Eugene (Ian Chen) and the delightful, bubbly Darla (Faithe Herman). These scenes remind us that comic books are generally about everyday heroes – we’re supposed to see ourselves in Billy and Peter Parker et al, and Shazam! does a good job of interweaving the larger-than-life super hero elements with unforced humour and effortless charm. Levi has a ball in his lead role, transferring the charisma and wry smile from countless supporting roles on television to the big screen. He’s the perfect go-between for the child-friendly tone and adults in the audience – his performance combines a great blend of all-guns-blazing-charm and a little self-referential humour. Strong, meanwhile, doesn’t really have much to work with as the fairly one-note villain; a running time of two hours plus feels as though it had room to flesh out Dr Sivana a little more. Towards the end of the film there is definitely a sense of flab – it’s a rare thing, a super hero film over two hours long, and it’s easy to see why here. The final acts of the film do begin to drag, and while Shazam! doesn’t stray into overwrought clichés and unnecessary action sequences, there is a sense that it could have benefitted from a little trim towards the end, as the emotional climax feels a little dulled by the credits (fair warning, there is a post-credits sequence). It does, however, enjoy its bigger screen IMAX glory; even larger than life with the enhanced scope, and an unlikely choice that proves worth going the extra mile for. Shazam! manages to give a little bit of life-force to the flagging super hero trend, largely because it’s aware, pokes fun at itself, doesn’t take itself too seriously, and remembers that going to the cinema is supposed to be fun. It looks at superheroes the way children do. It’s a little clunky, slightly overlong, but it’s unselfconscious, joyful, funny and – above all – fun. DC gets its groove back. Write your Shazam! (2019) Movie review.